This cute little dog is Mattie. 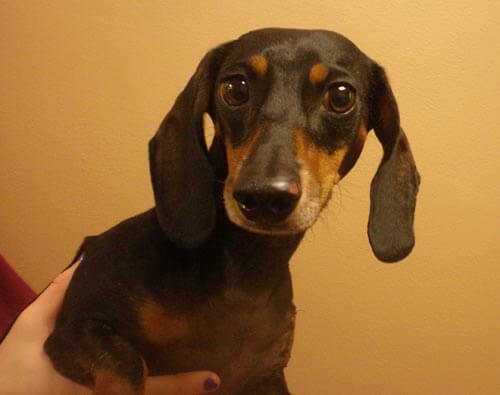 Mattie is a neutered male dachshund who is almost 5 years old. Mattie is owned by one of our clients who is currently enrolled as a college student in Texas. Mattie recently got loose, was hit by a car then taken to a veterinary hospital in Dallas with some severe injuries. Luckily, Mattie had a microchip and the hospital was able to contact his owner and start treatment right away. Due to the severe nature of Mattie’s wounds, a second surgery was needed and unfortunately his microchip had to be removed. Mattie’s owner is sure to have his microchip replaced as it is most likely saved his life. He is on the mend and doing very well. Way to go Mattie and congratulations on being our first Pet of the Month in 2011.